Last month we announced an exciting t-shirt contest in partnership with one of our fabulous sponsors, Tickled Orange - we asked all of you to complete the following sentence: "You might be a Clemson Girl if..."
We wanted to find the top 10 best responses to put on a t-shirt that would be sold to raise money for Dabo's All In Team Foundation, which supports a number of fantastic causes. Your response was overwhelming and the submissions were beyond expectations - some entries were so true of being a Clemson Girl...others were down right hilarious. The greatest challenge was trying to pick just 10.... but we did and the shirt is the perfect shirt for any Clemson Girl! 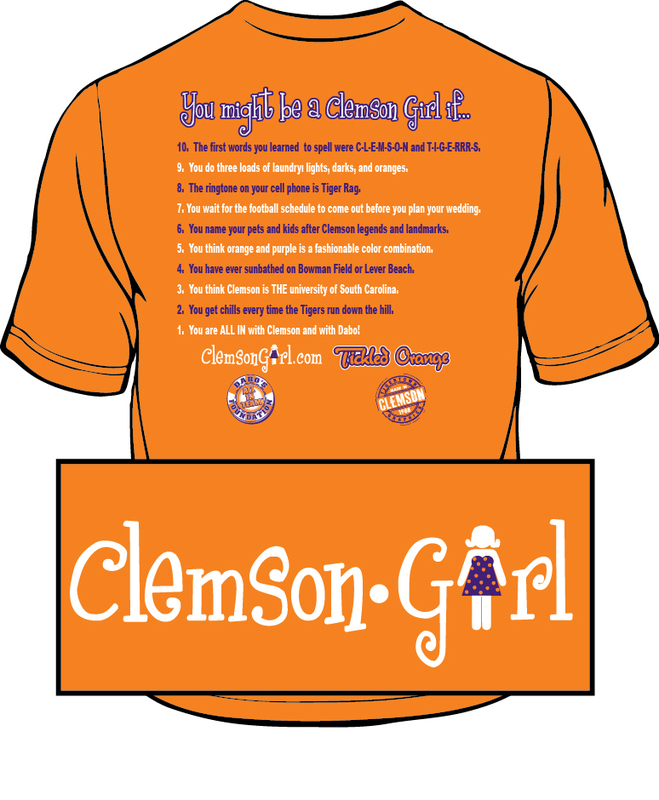 Front center chest: "Clemson Girl"
Back: "You might be a Clemson Girl if..." with top 10. **Please Note: There were multiples of some of the submissions - we chose winners whose entries were sent in first. You can now buy these shirts online on Tiger Town Graphics website and in the Tickled Orange store in Clemson. Every t-shirt purchase guarantees a donation to Dabo's All In Team Foundation! Share this t-shirt on Facebook and encourage your friends to buy one too. The more we sell, the more money we can donate to Dabo's All In Team Foundation! What are you waiting for? 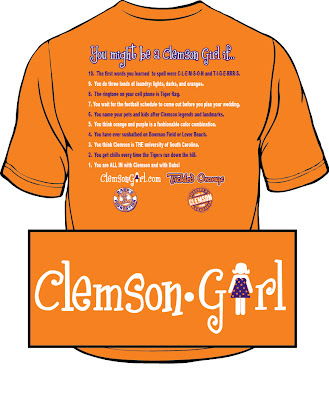 Support a great cause and get your very own, official Clemson Girl t-shirt! Let's show Dabo that Clemson female fans are ALL IN with support of Dabo's foundation and its great causes... Clemson Girls unite - let's make a difference together! Love, Love. Love this shirt! AND love that I can confirm every one of the ten reasons to be a CLEMSON girl! 10-first wds my children learned to spell-CLEMSON. 9-our laundry is always in 3 colors, lights, darks, orange!8-my ring tone is OF COURSE TIGER RAG.7-ALL events are planned around CLEMSON football schedule! 6-Umm... My child is named BOWMAN, dog- tilley! 5-Orange and Purple are the BEST color combinations! !, 4-spent many days of my youth on both Lever beach, and Bowman field!, 3-There is NO other university in SC!!!!! 2-for my entire life I have poured tears each and EVERY time the TIGERS run down that hill! !1- AND WE ARE ALL IN!! WE LOVE DABO!!! BUY THIS SHIRT SUPPORT HIS FOUNDATION AND WEAR IT PROUD! !- C. Lancaster- a Clemson girl!! How adorable! I definitely do a load of oranges, or two in the fall! Have to get this shirt!!!! #6-Gave my grandson a puppy for his birthday, and he named him Spiller. #10-Grandson couldn't spell his own name, but C-L-E-M-S-O-N seemed easy to him. #9-I do at least 2 loads of orange every week in the "off-season", more in football season. I could go on & on......We bleed orange in this house and we are ALL IN!!! !